The Night Rush Wolf Figurine is part of the Wolf Spirit Collection. 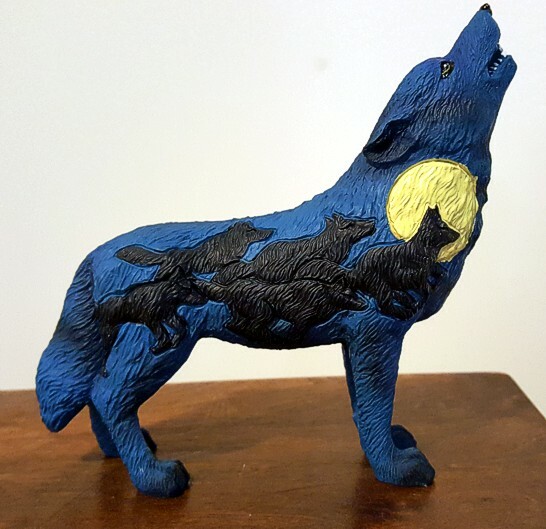 It features a howling wolf fashioned out of cold cast resin. The both sides of the Wolf is a carved out and hand painted design of a silhouette of a pack of Wolves running in a moonlit night. It comes in a white gift box and would make a great Wolf gift. Size: 6 1/4" x 2 5/8" x 5 1/2"